The watch company Oris has pleased fans of scuba diving with the chronograph ProDiver Kittiwake Limited Edition 1000M Diver, released in honor of the sunken recently in the Cayman Islands submarine USS Kittiwake. An impressive round watch case in diameter of 49 mm is made of titanium. The gray bezel in rubber and titanium is graded by diver markings. The watch has an impressive level of water resistance up to 1000 meters. The case on the top is equipped with a durable sapphire crystal. In the 3 o’clock position is set a screwed-in crown, protected on both sides by the protective ledges. Time is indexed on the black, decorated with a wavy pattern dial with central hour, minute and second hands. The wedge-shaped hour indexes and hands are coated with white phosphor compound. The date aperture is located at 6 o’clock position. The case back is made of titanium encrusted by the image of the submarine USS Kittiwake. ProDiver Kittiwake Limited Edition 1000M Diver is designed on the automatic mechanism Oris 733, based on Sellita SW200. The caliber, paved with 26 stones, provides a 38-hour power reserve and a balance frequency 28,800 vph. The rotor of the mechanism is decorated with the company’s logo. The luxurious "diver" comes on a titanium bracelet or rubber strap. The model is released in a limited edition of 500 items. In 2014, the watchmaker Oris is celebrating its 110th anniversary. In honor of this, the brand has developed a new mechanism with manual winding 110 of 177 components. Swiss watchmaker Oris has announced the release of a new watch Artelier Jumping Hour (Ref. 917 7702 4051 LS), which will be officially presented at the international exhibition of watches and jewelry BaselWorld 2014. The watch company Oris has announced the release of its next novelty Artix Pointer Moon (Ref. 01 761 7691 4054). The watch company Oris has introduced a new model Big Crown Timer Chronograph. Swiss watch company ORIS has introduced a new model Darryl O`Young Limited Edition 2014 (Ref. 774 7611 7784 Set), dedicated to the tenth Darryl O `Young` s Grand Prix in Macau. The watchmaker Oris has recently announced a three-year agreement with the Audi Sport team, participating in the World Championships in endurance racing FIA World Endurance Championship (WEC) and the German championship racing machines Bodywork class Deutsche Tourenwagen Masters (DTM). The Swiss watchmaker Oris has released a new version of the model Artelier Date Diamonds, decorated with 12 diamonds instead of hour markers. Swiss watchmaker Oris has released a new watch Artelier Translucent Skeleton (Ref. 734 7684 4051 LS), presented in a round polished case with a diameter of 40.5 mm stainless steel. Water-resistant - 30 meters. The crown is placed at the 3 o`clock position, decorated with the Oris`s logo. The Swiss watch manufacturer Oris presents the watch John Coltrane Limited Edition (Ref. 01733 7681 4084), which are devoted to the well-known saxophonist John Coltrane. The new WilliamsF1 Team 600th Race Limited Edition watch by the Swiss watch company Oris is dedicated to the 600th launch of the Williams team in Formula 1 racing (in the last ten years the brand is the official timekeeper of Formula 1 racing team Williams). The famous Swiss watchmaker Oris has released a new limited edition watch Air Racing Edition III - the third edition models that dedicated to the Oris Air Racing Team and its participation in the Reno Air Race. The watch brand Oris has introduced a new limited edition model Hirondelle, dedicated to the historic ship Hirondelle. The new line is launched in the amount of 151 items. Swiss watchmaker Oris, which is the official timekeeper and watch partner of RAID car rally, has released a limited novelty RAID 2013 Chronograph. An American crime thriller "Fast and Furious 6" by the director Justin Lin wins cinemas all over the world, and it is no coincidence. Part of this success is the Oris watch, adorning the wrist of stars. The actors chosen for the filming of this watch that accompany them during their new adventures. The Swiss watch manufacturer Oris announces the release of the novelty Oskar Bider Limited Edition (Ref. 7567 774 4084). It is dedicated to the centennial of the first flight across the Alps, carried out by one of the pioneers of aviation, a Swiss pilot Oskar Bider in 1913. This year, the famous watch brand Oris has presented at the international exhibition in Basel a new original watch ProDiver Pointer Moon, which is developed in cooperation with the company’s ambassador, a diver Roman Frischknecht. The famous Swiss watch brand Oris has released a new diver's watch Aquis Regulateur «Der Meistertaucher» (Ref. No. 749 7677 7154), presented in the round titanium case with a diameter of 43 mm. The famous watch brand Oris, noting the significance of the vital work of RFDS Australia, represents a novelty Oris Royal Flying Doctor Service Limited Edition (Ref. 7672 735 4084), which is issued in a limited edition - 2000 items. The watch company Oris is an official partner of the “Rally Clásico Isla Mallorca”, International Rally on the island of Mallorca (Spain), collecting rally teams and car enthusiasts from across Europe. Swiss watch brand Oris has released a novelty Aquis Depth Gauge (Ref. 7675 733 4154), made in the classic style of diving. The model is equipped with a depth gauge. The watch company Oris for many years involved in the rescue and protection of the marine environment. The contribution of the brand is in the release of numerous limited series, including novelties such as the Great Barrier Reef, Save the Maldives and Tubbataha collection. The famous watch brand Oris has announced the start of photo contest Oris Culture, which participants can register and presents their works on the company's page in Facebook. Work should reflect the author's attitude to music, art, literature, and the "culture world of Oris». The legendary watch brand Oris presents its new Challenge International de Tourisme 1932 watch, which is dedicated to the Pole Franciszek Tsvirko team that won the Berlin Air Show in 1932. Swiss watch company Oris has announced the release of its novelty BC3 Air Racing Silver Lake (Ref. 01 735 7641 4184-Set), dedicated to the Oris Air Racing Team and participation of the company in the air show Reno Air Race. It is not a secret that today many famous watch brands cooperates with a particular sports team or sponsor events related to the world of sports. This, on the contrary, inspires athletes to reach new heights, and watchmakers to create new original models. 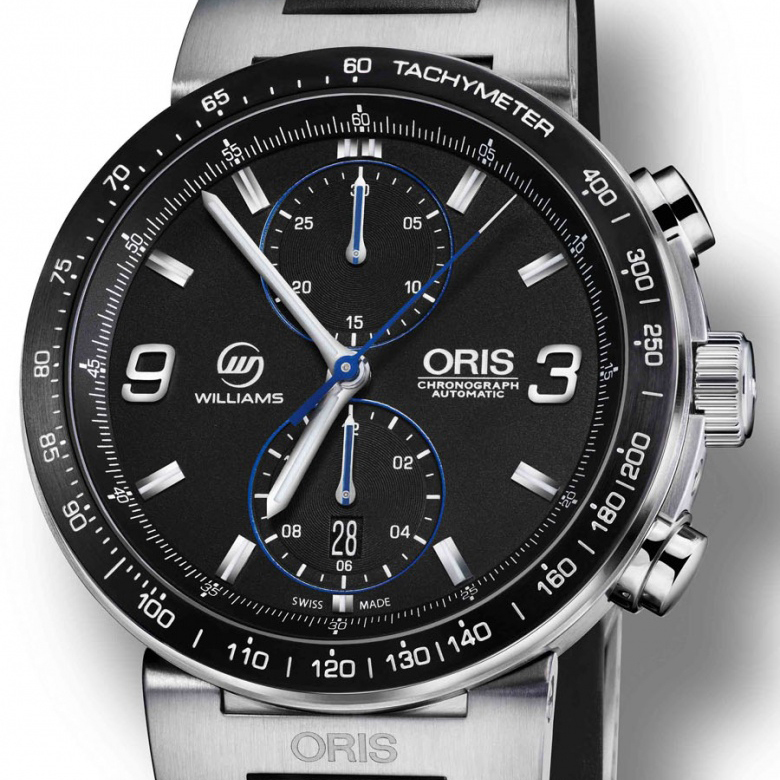 Williams F1 Team and the famous Swiss watch company Oris have signed a new contract to continue the mutually beneficial cooperation in 2012. At the world exhibition BaselWorld 2012 the Swiss watch company Oris has introduced a new watch Oris Aquis Titan Chronograph (Ref. No. 674 7655 7253). The Swiss watch company Oris at the annual exhibition BaselWorld 2012 has introduced an exciting new watch Oris Artelier Regulateur (Ref. No. 749 7667 4051). At the world exhibition BaselWorld 2012 the watch company Oris has introduced a new delicious model Big Crown Timer (Ref. No. 735 7660 4264). The Swiss watch company Oris at the annual exhibition BaselWorld 2012 has introduced its new watch Oris Tubbataha Limited Edition (Ref. 749 7663 7185). The Swiss watch company Oris, which is one of the leading brands at the world exhibition of watches and jewelry BaselWorld 2012 has introduced a new watch Oris Artix GT Chronograph (Ref. No. 674 7661 4434). Swiss watch company Oris presents a novelty, the whole painted in gray color. This monochrome watch Big Crown Date Grey, which is always near when you need it and at the same time do not attract too much attention, due to its color does not stand out on the wrist.